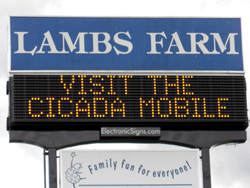 When ElectronicSigns.com was selected to handle the upgrade of an incandescent message center for Lambs Farm in Libertyville, Illinois we were thrilled to be able to help this worthy non-profit agency. Lambs Farm was on a tight budget and the electrical costs for their existing incandescent message center were constantly rising. We were able to replace the old incandescent technology with bright Amber LEDs using a Roadstar 89mm display. Visual Communications, Inc. has been providing LED sign systems to a wide range of national and international clients for over 16 years. Our online presence, ElectronicSigns.com, is backed by the experience and reputation of Visual Communications as a leader in Electronic Display sales and support. From the small local business to the large Fortune 100 company, we are there to assist you with your LED sign projects. Our knowledgeable staff can participate in all aspects of the process including project consultation, product selection, networking and installation guidance, as well as ongoing hardware and software support and service. We stock most standard LED signs for immediate shipment. Custom projects are always welcome, and have actually become more common as applications for our products continue to expand. Our customers can be found be all over the world. From New York to California -- from the Caribbean to the UK -- ElectronicSigns.com and Visual Communications has maintained a reputation for quality products and expert service and support. We invite you to visit our project galleries to see the many ways LED signs have helped our customers increase their sales and profits. Please feel free to contact us at 800-341-6397 with any questions you have or to discuss your electronic display projects and requirements. For more information, please feel free to contact us at 800-341-6397.